Ella ‘Kini’ Maillart was an ardent traveller, a bride of the wind and a storyteller, like the world had not seen before. 2017 sees the 80th publishing anniversary of her Forbidden Journey from Peking to Kashmir. Let us celebrate the occasion and take in the sweeping panorama of her adventurous life story. Firstly, she was as free as the breeze. 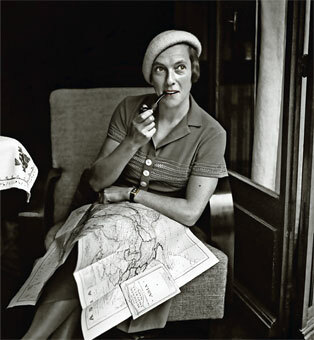 She also was one of the great travellers of the 20th Century and lived life to the fullest and on her own terms. Thirdly, she was a pioneer: As a photographer, as a connaisseuse of the Far East, as a self-marketing publicist, and as a woman far ahead of her time: independent, fierce and astute. Fellow travellers and sisters in spirit, daring and dashing women, who inspired the desire to visit (or at least dream of) certain far places, would be Isabella Earhart, Karen Blixen, Alexandra David-Néel, Freya Stark, Isabelle Eberhardt, and Edith Wharton. Ella Maillart’s athletic upbringing in Switzerland, her meandering across Asia and her reclusive later years in a mountain chalet speak of a person who was focused, before anything else, on one thing: Truthfulness to her own nature. If one would like to pin her down on a job, there were many – and not many things infuriated her more than being pinned down. So, let us take note that during her life she was, for a few months, a French teacher in Wales (who spoke no Welsh and hardly any English, which must have estranged her in that community at least as much as among Mongolian nomads), she also worked as an actress, stuntwoman, sculptor’s model, secretary, photographer, travel journalist, lecturer, and, in later years, as a tour guide. Maillart was the author of eight books, and left 16,000 photographs of her journeys to the Musée de l’Élysée in Lausanne. In her home village of choice, Chandolin, in the Swiss canton of Valais, she spent the autumn of her life in a cosy book- and antiques-filled chalet, named Atchala (after Shiva’s unmovable mountain of the Ramayana) built into the steep grassy mountainside. To this day she is regarded by the villagers as a celebrity, if not as a local saint. The daughter of a well-to-do fur trader from Geneva and his sportive Danish wife, Ella Katherine Maillart is born in 1903 and grows up in luxurious loneliness: A sickly child, she feasts on adventure books and topographical maps and grows hungry for horizons. Her busy and socially minded parents leave her pretty much to her own devices and let little ‘Kini’ go her way. 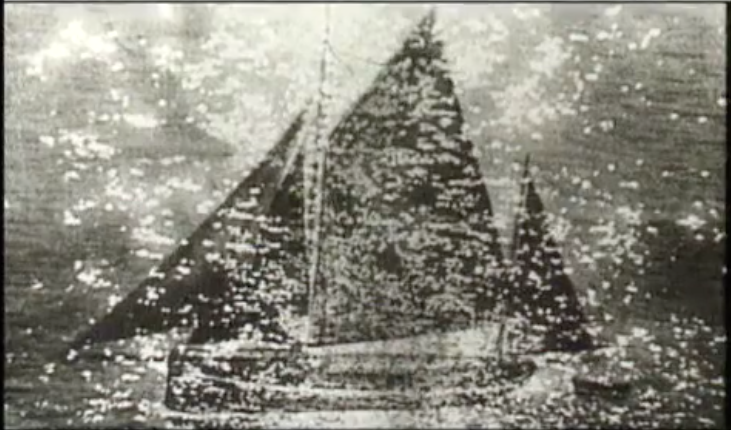 Her way soon leads her to the yachtsmen and sailors of Lake Geneva who teach her and her best friend Hermine (“Miette”) de Saussure, the daughter of a French naval officer, how to maintain and navigate a sailing boat. The two girls learn about independence and responsibility and fall in love with the elating sensation of casting off, the light sparkling on the waves of the lake and the unrestrained, almost personal presence of the wind – who may turn out to become Ella Maillart’s trustiest companion throughout life. Ella and Miette win their first sailing race aged 13, and around the age of twenty, these two tough vagabonds of the Sea sail from Cannes to Corsica, then to Sardinia, Sicily and Greece. They even try to sail to America on Miette’s yawl Atalante but have to turn around as soon as the coast of Brittany disappears behind them because Miette has fallen seriously ill. After her recovery, Miette marries and the idea is abandoned. 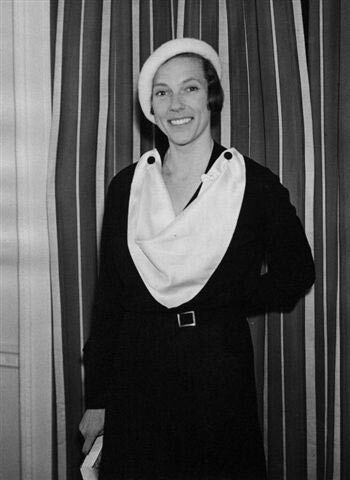 Still, Ella Maillart continues to sail the Atlantic as a deckhand under contract of English boat owners, and she represents Switzerland in the single-handed sailing competition at the 1924 Olympic Games. Among competitors from 17 nations, she places ninth – the only woman in the competition. At the time, she is also captain of Switzerland’s Women’s Field Hockey Team. When winter whitens the Swiss Alps, and the vast, almost marine expanse of Lake Geneva is partly covered with ice, young Ella turns to skiing, which then is still an eccentric pastime of the English aristocracy. 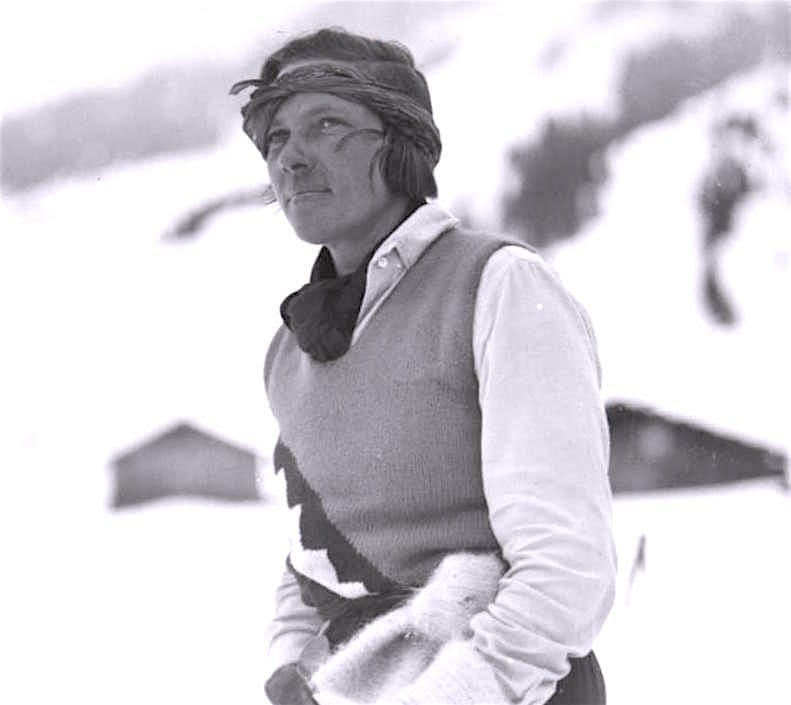 Soon, she races as a member of the Swiss National Team at four World Championships from 1930 to 1934. Rich and restless, as well as informed by a keen social awareness, she harbours deep doubts about the belligerent materialism of Europe and its siege mentality. She realises that tenurial possession leads to judgemental immobility and spiritual stagnation – just as a body not moving enough develops cancer, a mind not moving enough develops depression, and a culture not moving enough develops fascism. When Ella Maillart, a self-declared worshipper of Helios, takes the advice to write about Russia’s youth in 1929, she doesn’t yet know that this excursion will set her on her blazing trail towards the rising sun for a lifetime. In Berlin, she meets Jack London’s widow Charmian, who sees the glint in her eye, and who helps her out with $ 50.-, so Ella can continue on to Moscow, where the Countess Tolstoy gladly puts her up. 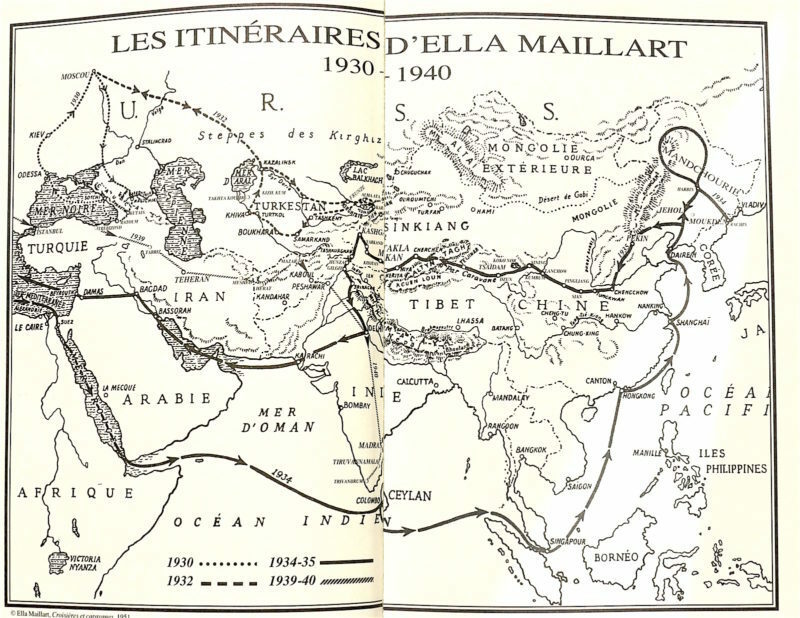 In 1932 Ella Maillart journeys to Russian Turkestan by train via Moscow. There she observes that the industrialised communist regime is, in fact, destroying the ancient nomadic lifestyle just like Mao Tse Tung’s communist expansion will all but exterminate the ways of nomadic tribes in Tibet thirty years on. She crosses Kirghizstan on horseback as far as the Celestial Mountains of T’ien Shan. There she climbs a mountain of 5000 metres and skis down its flanks on makeshift skis. She explores Tashkent and Samarkand and rides down the Amu Daria. On a camel, she crosses, solo (! 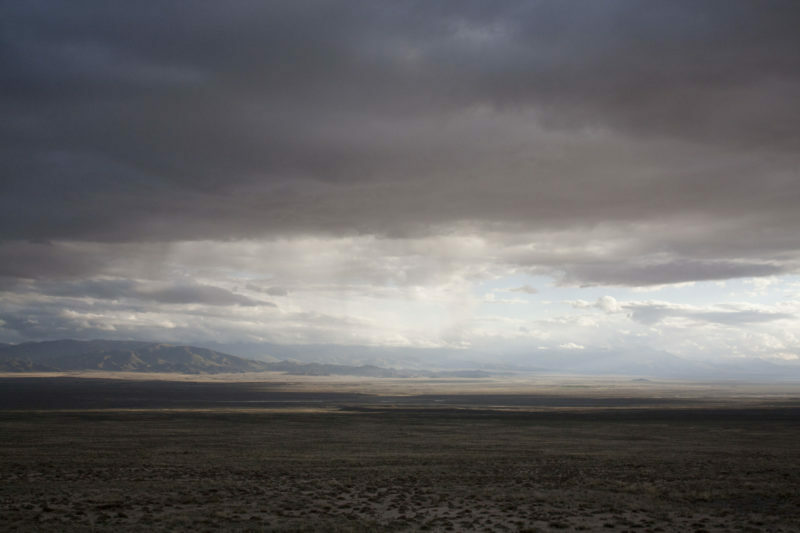 ), the Desert of Red Sands, trying to avoid dangerous Soviet checkpoints. All this in her late twenties, without a cell phone, GPS, Google Earth, or any expedition equipment to speak of. A bad case of dysentery or a broken limb could have killed her, and nobody would have heard from her ever again. But however arduous the conditions, they allowed her to immerse herself in a foreign world like it is hardly possible anymore in our age. Across the passes of the sun-beaten highlands, Ella catches a glance of the yellow immensity of Takla Makan, literally meaning “the abandoned place”. Following the motto of her life, she vows to return one day to northwest China and to explore this forbidden desert in tricky-to-travel Xinjang: “Nobody can go? Then I shall go!” Her account appears under the title Turkestan Solo (Des Monts célestes aux Sables rouges; Grasset, Paris 1934) in English and in German. 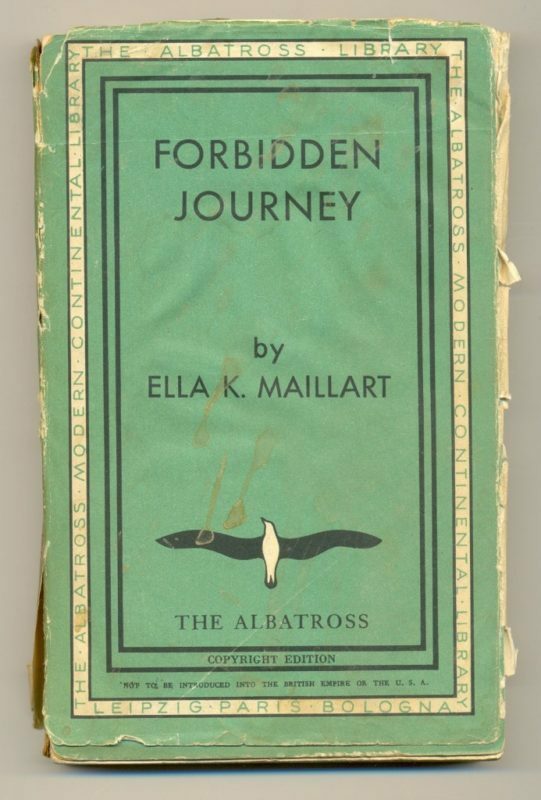 The book puts Ella Maillart on the map as a travel writer. It takes a powerful will, and even more, an unusual level of fitness to even consider the journeys by foot, horse or camel which Ella Maillart has become famous for. It seems like her bedbound childhood years spent reading books of geography and travel literature, and her sportive teenage years were the perfect preparation for a life of frugality, endurance and hardship. Ella Maillart can be described as an impersonation of unique mental and physical force. It even shows in her gaze and her dynamic stride on films from her later years: the transfixing clarity of her sapphirine eyes, the warmth and generosity of her personality, the springiness and vitality of her walk and her quick-witted, alert presence. The next chance to prove that she has what it takes offers itself to Ella Maillart in 1934. In a London nightclub, she has a few beers with the suave journalist and travel writer Peter Fleming (1907 – 1971; the elder brother of James-Bond-creator Ian Fleming), together with whom she is invited to a party given by a mutual orientalist friend. “How do I get into the Soviet Republic in South China?” she asks Fleming, who is then The Times’ China correspondent. “You don’t,” he answers, explaining to her the physical dangers and bureaucratic obstacles of this remote and historically war-torn region, especially after the recent Kumul Rebellion. As they part that evening, she swings around once more: “See you in China, probably.” “Yes. See you in China…” answers Fleming, recognising that special glint in her eye. The unlikely pair, cast like characters in a Hugo Pratt graphic novel, meet again in the spring of 1935 in Peking and embark together on a 3,500-mile journey across China from East to West. Ella’s shopping provisions for the small caravan, taken in Peking include: Coffee, cacao, jam, chocolate, curry, maccaroni, porridge, mostrich, and five to six bottles of cognac for cold days or for hours of defeat, plus four boxes of tobacco “for the gentleman”. It is not quite clear who takes whom along on this pioneering adventure: the corresponding gentleman the vigorous adventuress or vice versa. 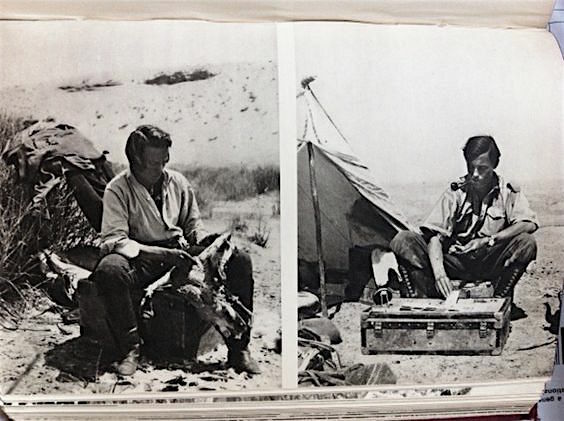 Only preceding their encounter shortly, both writers have written travel narratives with titles that emphasise on their respective author’s rogue tendencies: Fleming with One’s Company, and Maillart with Turkestan Solo. Yet both sense that the other one would be not only useful but perfectly complementary: As a citizen of Switzerland, Ella can’t rely on the infrastructure and social connections of the British Empire – an inhibition to her solo plans of course, which is greatly eased by Fleming’s company. A well paid British journalist and a smart dealer with the Chinese authorities and their provincial civil servants, whose languages he speaks better than Ella, Fleming is also a good shot with his .22-calibre rook rifle. Ella’s gifts to this functional marriage of plans: She can speak Russian, mend small wounds, prepare and grill game on small brush-fed fires, and she knows the caravan life. Also, she has learned to “put a good face on, even at the last gasp”. Clearly, the success of this seven-month journey is due to the fact that Fleming and Maillart did not find each other all too attractive. If Hollywood had made a film out of this adventure, it would have constructed a perfect vehicle for a tough and quickwitted Katherine Hepburn and a spoiled, slightly goofy Cary Grant in the golden days of Tinseltown; nowadays Maillart and Fleming could be embodied, quite fittingly, by Scarlett Johannson and, say, Eddie Redmayne. The door behind me opened and Kini came in. 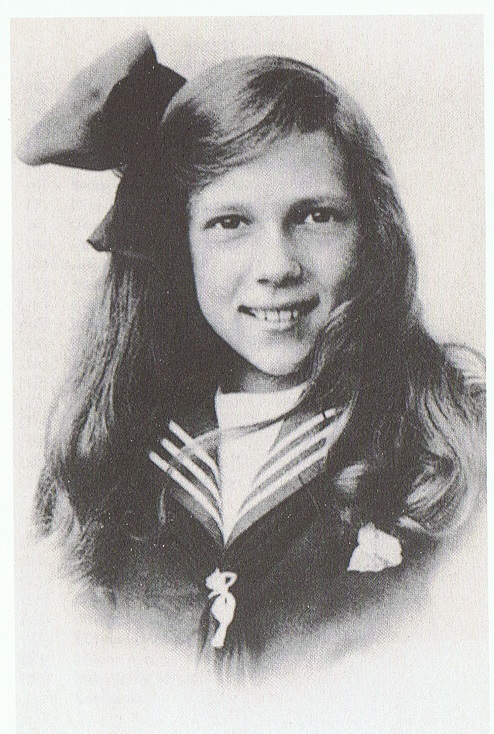 Whereas Fleming describes Ella gallantly as the heroine of his book – and is endlessly impressed by her tough-as-nails-nature – she lovingly but sarcastically employs him in her account of the trip as an entertaining, spleen-inclined character, coming off as a slightly pompous, pomaded, pipe-smoking public-school-Peter-Pan. 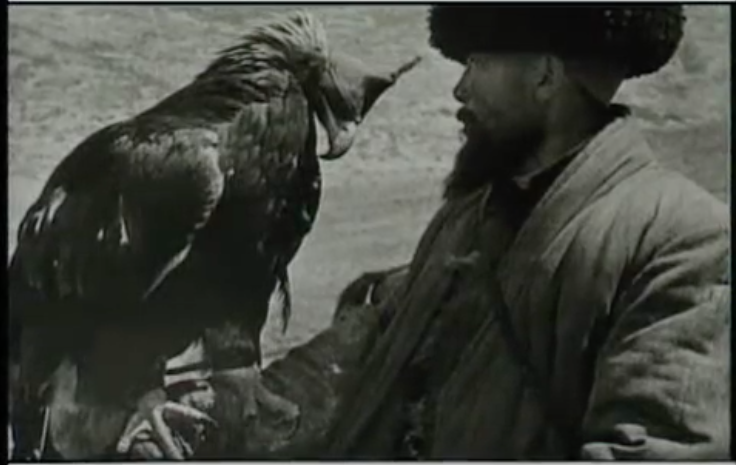 He arrives on the scene already angry because he could not shoot a tiger on the way from Wladiwostok to Manchukuo. On the other hand, she likes his wicked humour and his cold pragmatism (which he seems to have in common with his younger brother Ian), and realises, most importantly, that Peter is born under a lucky star. 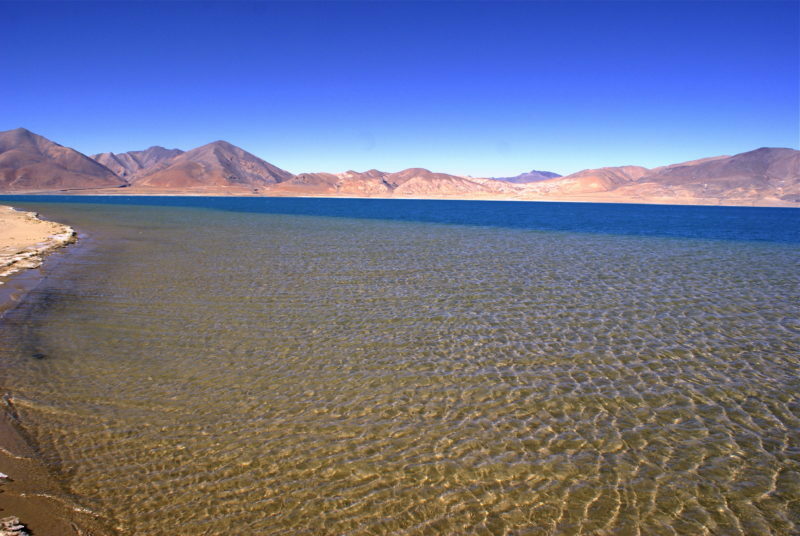 Their trek leads them to the Buddhist lamasery of Kumbum, along the enormous emerald mirror of the Koko Nor salt lake, across the northern edge of the Tibetan plateau and the southern rim of the Takla Makan desert, passing by the Pamir mountains and the Karakoram to reach Kashgar and Srinagar where Islam and Buddhism meet, and finally the Indian Himalayas. While Fleming’s account of the journey, News from Tartary, is polished and witty, dismissing the substantial difficulties (heat, dying pack animals, border guards, thugs, thunderstorms and food poisoning) with off-the-cuff irony, Ella’s book Forbidden Journey is written for the ages. 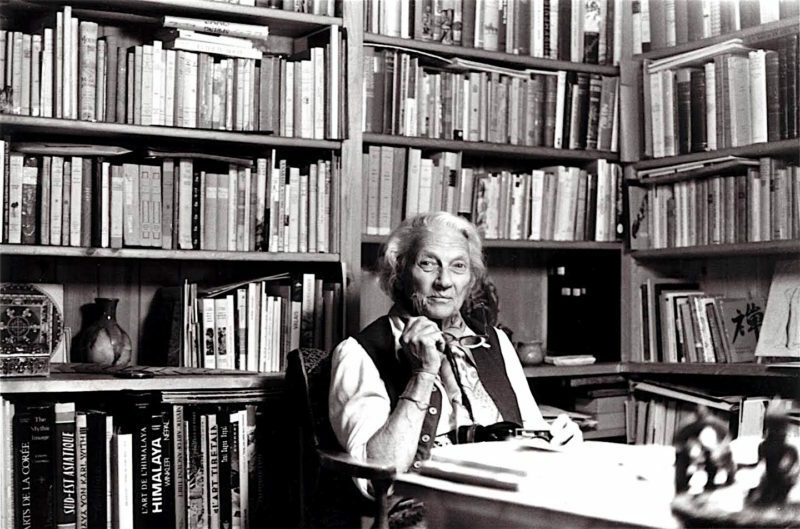 One could argue that her Swiss citizenship made her free as a writer (at least freer than Fleming, whose every paragraph is written to the greater glory of the empire): Her travelogues don’t touch on borders with colonial discourse, they are also more emotional, more marginal and do not have to please any Anglocentric expectations. In comparison to her companion, she is also the more empathetic narrator, having heartfelt compassion for man, woman, child and beast – particularly for her sick horse Slalom, which she has to leave behind at some point. 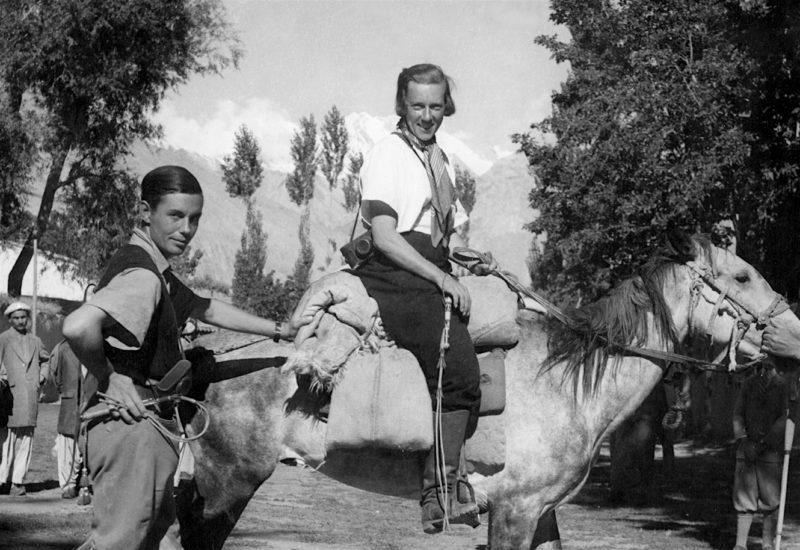 1939 sees Ella Maillart again on the road to Afghanistan, known later as the hippie trail. 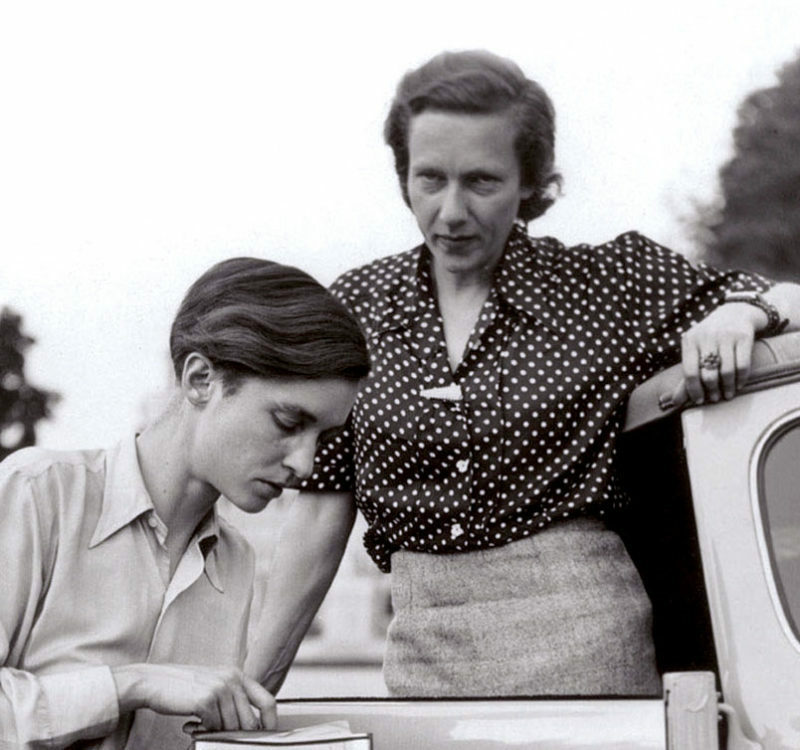 This time, another strong-headed and rebellious Swiss woman accompanies her: the writer and reporter Annemarie Schwarzenbach. Ella sees herself as a sensible elder sister who could cure the younger woman’s depression and, to her horror, realises how heavily addicted the tormented Schwarzenbach is to morphine. To cap it all, Ella and Annemarie are in love with each other. The two women set off from Geneva in a small Ford and drive to Istanbul, Teheran and on to Kabul via the northern route through Afghanistan. At arrival in Kabul, World War II breaks out, and they unhappily split up. Ella’s sobering account is published under the fitting title The Cruel Way: Two Women and a Ford in Afghanistan (La voie cruelle). Schwarzenbach travels on to Turkmenistan, then returns to Europe and dies three years later in a bicycle accident. Ella continues on to South India and spends the next six years near an Ashram in Madras, with a cat, immortalised in her book Ti-Puss. She meditates, writes, hears the lectures of Atmananda Krishna Menon in Kerala, and modestly lives from her royalties. After the war ends in 1945, she returns to Europe, and builds her chalet in Chandolin, where she spends six months every year “from the last to the first snows”, and travels the rest of the year. In 1951 she goes to Kathmandu and to the Bagmati and Langtang regions of Nepal, which has just opened its borders to visitors. With the help of Toni Hagen, a Swiss geologist and a pioneer of development assistance, she treks to Melamchi Valley and to the sacred Gosainkunda lake and gets to know the multi-cultural Himalayan kingdom. 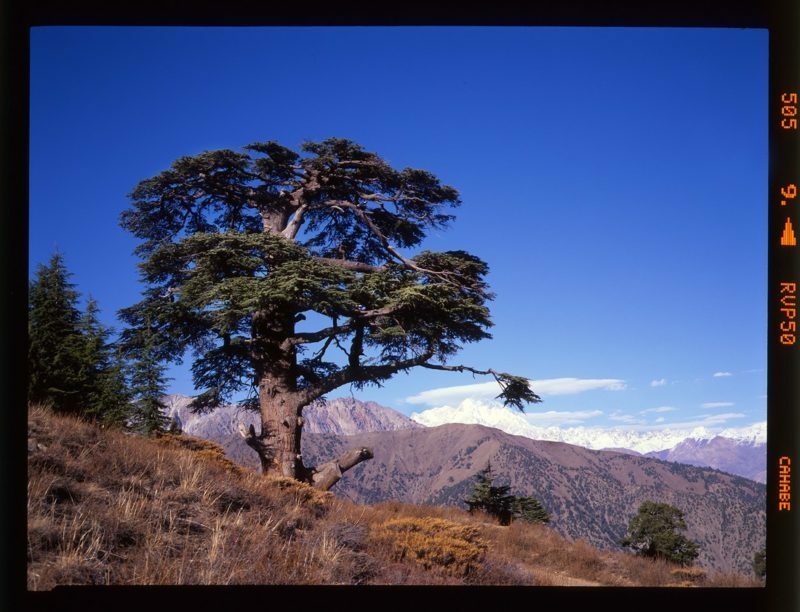 This first visit to Nepal she turns into a book, illustrated with her own photographs: The Land of the Sherpas. Until 1987, she will have returned to the roof of the world at least forty times as a guide for small tourist groups.